The year 2019 is the 400-year anniversary since the end of slavery for black men and women living here in the United States. Yet despite daily reminders to “Make America Great Again”, on any news channel, it’s quite evident that being a black male or female in America is still considered an offense. We can’t go for a walk, swimming, to the park, out for coffee, to work, to school, or even be in our own home without being murdered, verbally or physically attacked. So, what exactly are we celebrating this year? Yes, we can agree that compared to the harsh and unimaginable conditions our ancestors had to endure, things have vastly improved. However, if we really look back and study the characters and the plot twists, those in power are much the same now as they were then. This country’s foundation was built using biological warfare, systematic processes, government law and corruption, political lies, and murder to blatantly steal this land from our native ancestors. Today these same tactics are still being used against us, so are we free? And if we are not free, who holds the key to our freedom? These questions and others will be answered and the key to our freedom will be revealed, when the original man and woman reunite to restore their natural rights and proclaim their identity to the world! Save the dates and make plans now to attend The Building Bridges Black Unity Tour coming to a major city near you this Fall, and be a part of the evolution and revolution of the Black race. This powerful event will be one of this year’s most impactful events hosted by Phil Scott (The Advise Show), Dynast Amir (Search for Uhuru), and Her Excellency Shanta Lana Hereford (Center for Truth and Healing). Special guests will include Ms. Njeri Rionge, listed on Forbes’s List as Africa’s Most Successful and Revered Serial Entrepreneur. Bro. Rizza Islam (International Humanitarian), Bro. Ben X (Community Organizer), Brenda Smith Lezama (TV Personality), Bro. Deric Muhammad (National Activist), Bro. Yahcanon Ben Yah (Chairman, The New Black Panther Party), Michael Campbell (CEO, Black on Purpose TV), and many more will be featured. Join a movement that is already over 1 million strong and is aimed at educating and empowering our brothers and sisters scattered across the earth. If you are Black and breathing, we are summoning you to come together peacefully and with an open mind and heart to build bonds and bridges that will change the world as we know it. 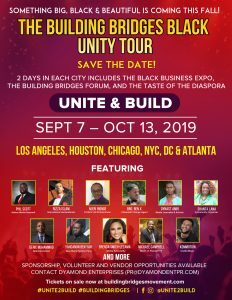 The Building Bridges U.S Unity Tour runs from September 7th, 2019 to October 13th, 2019 in Los Angeles, Houston, Chicago, New York, Washington DC, and Atlanta. To participate as a venue partner, guest speaker, event host/entertainer, sponsor, vendor, volunteer, media, or in any capacity, please visit http://buildingbridgesmovement.com. Purchase tickets here. Sponsored by the CFTH, Building Bridges Global Group, Dyamond Enterprises, The Star Factor Effect, The Brantley Foundation, and more. ← CFTH Joins The Keep DeKalb Beautiful Family!